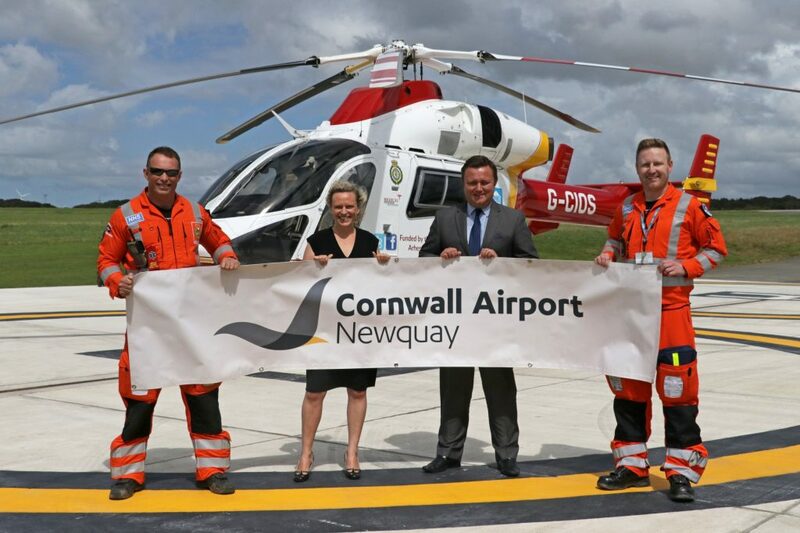 Cornwall Airport Newquay is taking being a good neighbour to new heights by choosing Cornwall Air Ambulance as its charity of the year. Workers at the airport chose to raise money for the lifesaving charity during a staff vote which saw Cornwall Air Ambulance come out on top. Jackie Southon, the charity’s Head of Income Generation said: “Both organisations have worked closely together for many years due to the fact Cornwall Air Ambulance headquarters is located at the end of the airport’s runway. We’re now taking that relationship to new heights and we’re very grateful to all the Cornwall Airport Newquay staff who voted for us to be their charity of the year. Paramedic Jeremy Griffiths, Cornwall Airport Newquay Marketing and Communications Manager Amy Smith, Cornwall Airport Newquay Operations Manager Richard Thomasson, Paramedic Thomas Hennessy Jones. 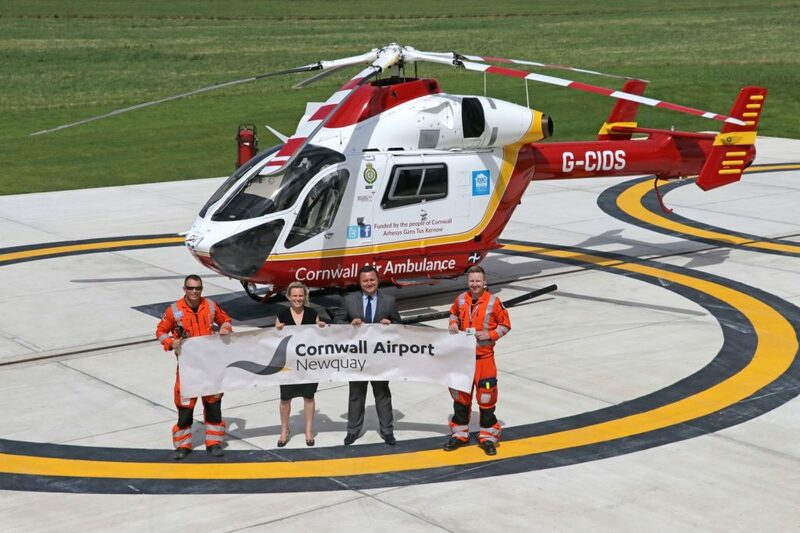 Al Titterington, Cornwall Airport Newquay’s Managing Director, added: “We’re proud to be supporting the Cornwall Air Ambulance as our charity of the year. The air ambulance provides an essential service for both Cornish locals and visitors to the county. Cornwall Airport Newquay is the fastest growing airport in the UK with more than 60,000 passengers passing through the terminal in July 2017 alone. It flies to destinations throughout the UK and Europe, including London, Faro, Frankfurt, Dublin and Alicante. To find out more about supporting Cornwall Air Ambulance, including the 30 for 30 fundraising challenge, visit cornwallairambulancetrust.org. For further information and interviews: James Oxley, Communications and Marketing Manager ( james@cornwallairambulancetrust.org, 01637 88 99 26 / 07817 929679) or Kate Hucklesby, PR, Marketing and Media Officer (kate@cornwallairambulancetrust.org, 01637 88 99 26 / 07817 929679). Cornwall Air Ambulance Trust is the charity that fundraises to operate the helicopter emergency medical service for Cornwall and the Isles of Scilly. Every year our helicopter responds to around 700 emergency calls for help and is on-scene at an incident in an average of just 12 minutes. The helicopter can reach patients in any part of Cornwall, significantly reducing the time taken to get seriously ill patients the treatment they need – in hospital or on-scene. t costs £3m per year to operate this service, and with no National Lottery or direct government funding, the charity relies on the generosity of the people and businesses of Cornwall.